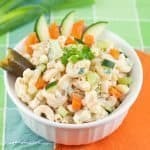 This lighter macaroni salad is made healthier by using whole wheat pasta, Greek yogurt, & lots of fresh veggies. The perfect healthy side dish for a picnic! Cook macaroni according to package directions. Drain and rinse with cold water. Mix together all dressing ingredients in a large bowl. Add macaroni and vegetables. Stir to combine. Cover and refrigerate for at least 4 hours before serving (I prefer overnight! ).